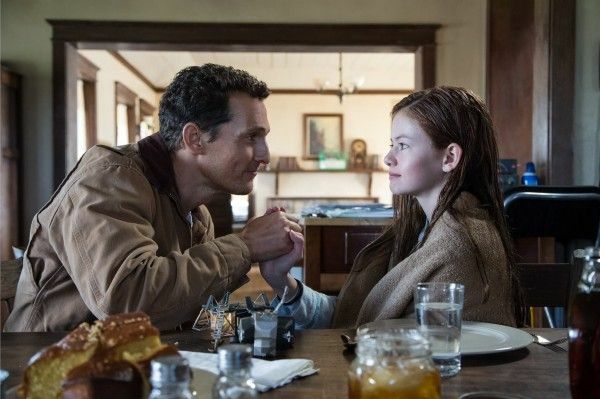 Christopher Nolan’s Interstellar is finally in theaters. As most of you know, Nolan wrote the screenplay based on a previous draft by his brother, Jonathan Nolan (The Dark Knight). 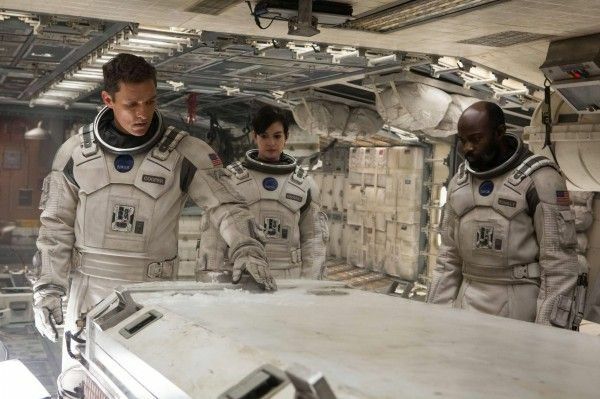 The story finds a crew of astronauts led by Matthew McConaughey setting off into deep space in order to find a new planet that might be inhabitable. 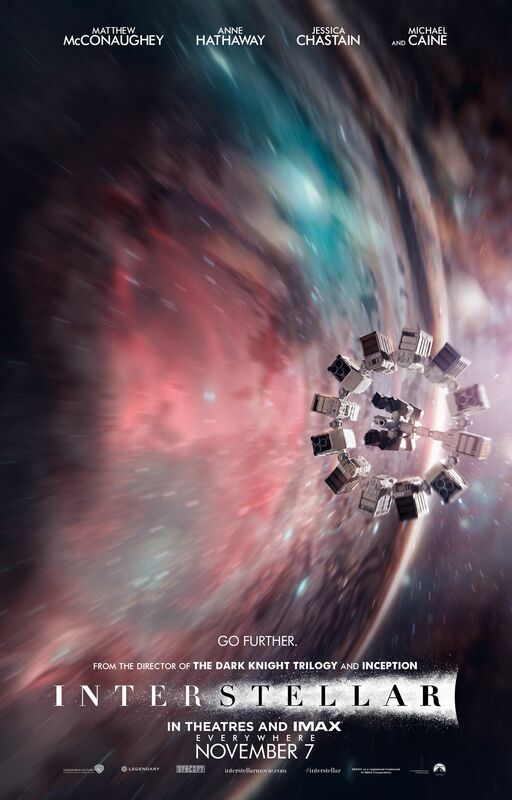 Loaded with a great cast (Anne Hathaway, Jessica Chastain, Casey Affleck, Michael Caine, David Oyelowo, Wes Bentley, John Lithgow, Ellen Burstyn, Topher Grace, David Gyasi, Mackenzie Foy, Bill Irwin, and Timothee Chalamet) and amazing visuals, Interstellar should be seen on the biggest screen possible. If you have an IMAX theater near you, I strongly suggest seeing it in that format. For more on the film, watch these featurettes, clip, or click here for all our coverage. At the recent Los Angeles press day I was able to participate in a press conference with Christopher Nolan, Matthew McConaughey, Anne Hathaway, co-writer Jonathan Nolan, producer Emma Thomas, and Jessica Chastain. They talked about the experience of making the film, how the project came together, how much the script change once Nolan replaced Steven Spielberg as director, writing a science fiction movie with so much hope, working in the space suits, space exploration, if there were any deleted scenes, the involvement of NASA, and so much more. Hit the jump for what they had to say. 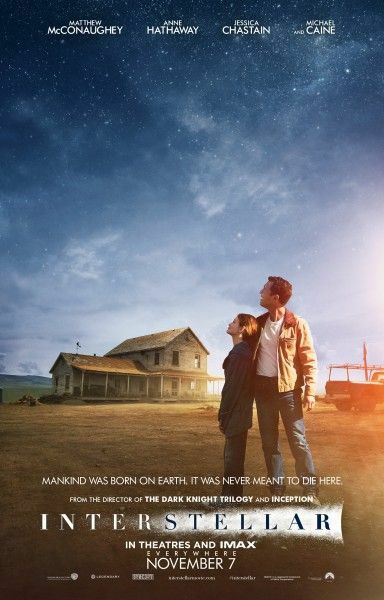 Question: In the Q&A last night with your actors they said that this movie might still have been a film without space exploration, and I’m very intrigued by that. In other words, there’s a substantial portion of this film that’s an intimate family drama, and I’m curious how you see marrying two separate ideas and blending them into a space odyssey that has this rooted feeling in the dirt, literally the dirt of earth. CHRISTOPHER NOLAN: I don’t think of it so much as two separate things as just a realization – when I first looked at Jonah’s draft on Interstellar it was very clear that at the heart of the story there was this great set of characters, this great family relationship, and we found that the more you explore the cosmic scale of things, the further out of the universe you went, the more focus came down to who we are as people and what are the connections between us. Just to speak to the creative approach we were taking, when it came to Hans Zimmer’s involvement in music, one of the things I did with Hans was I didn’t want him to know what the genre was before he started working, so before I actually started working on the script, I wrote out a page of what I considered to be the heart of the story, the relationships, the idea of a father having to leave his child, his children, and I gave that to Hans and said, “Work on that for a day and give me what you’ve got at the end of the day, and that will be the seed that we grow the score from.” And indeed the finished score came from that particular creative act, and I think that is just an illustration of the approach we tried to take in terms of keeping this about the humanity and using the exploration of the universe as really a lens through which to view ourselves as human beings. JONATHAN NOLAN: Just building on that, we are the only instrument for understanding the universe. We have to ground it in human beings. The first step when writing this film was trying to understand some of the science behind it, that’s where we started. First I was trying to understand relativity, because it felt like it would be an important, interesting story element and what I was struck by – Einstein’s a fascinating figure who didn’t have any instruments that he used, he didn’t use telescopes, he used his mind to try to understand the universe. And you’d read these thought experiments that he’d come up with; it was always two people on a train or twin brothers, one’s on a spaceship, and you read enough of these and you start to realize the common element of all these thought experiments that Einstein did to understand the nature of the massive scale of the universe around us, there were always people at the heart of all of them, there were these relationships at the center, melancholy or longing or sorrow, one person on a train at the speed of light. And Chris suggested the idea that if you want to explore these bigger questions you have to move in the opposite direction to make sure that it’s grounded in a human experience. I found it fascinating watching a science fiction movie with so much hope, when you guys were writing it where did you find that hope and optimism? Where was all that rooted in? CHRISTOPHER NOLAN: I think really space exploration, to me, has always represented the most hopeful and optimistic endeavor that mankind has ever really engaged with. I was certainly struck when they flew the space shuttle in, the 747 when it came to the science center here in LA, were up in Griffith Park with hundreds of people waving flags and watching this thing fly down and it was a very moving moment actually, and a little melancholy at the same time, because what we felt was that sense of that great endeavor, that great collective endeavor, the hope and optimism of that is something it feels like we’re in need of again. I feel very strongly that we’re at a point now where we need to start looking out again and exploring our place in the universe more. For Anne Hathaway and Matthew McConaughey, I’m wondering about the challenges of acting through a spacesuit. I would imagine it would change your physicality. Having that helmet on, did it hinder any emotions or anything like that? MATTHEW MCCONAUGHEY: The suit was only something like forty pounds, is that right? 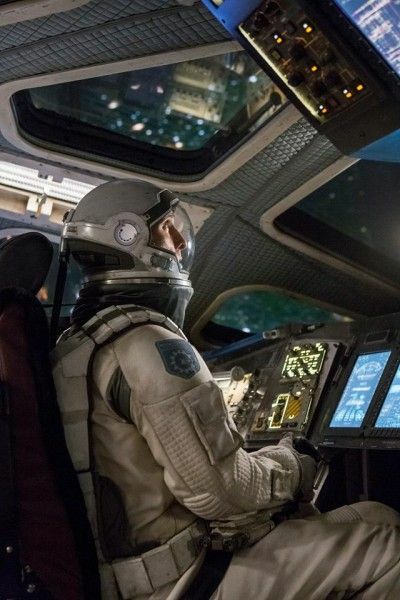 MATTHEW MCCONAUGHEY: [Laughs] I think a real space suit is closer to a hundred, so they did a lot of work on making it as light as possible and as easy to maneuver in. Could you break out into a sprint? No. Could you jump as high? No. Once you get the suit on a lot of it, as far as what you could express directly, was, yes, from the neck up and sometimes through the mask. But I don’t know, for me, it was just part of the story that made sense, it didn’t use that as a cockpit. There was a lot movement – it was physically more challenging in Iceland, you know, in a spacesuit on a glacier [laughs], with the elements, absolutely, a couple of helicopters in fifty mph winds. ANNE HATHAWAY: Yeah, I don’t think it hindered it. The first time I put it on, I made up my mind that it was my favorite costume I have ever worn and thanks to this man to my right I’ve gotten to wear some pretty spectacular ones, but this one it was the closest I’ve ever felt to feeling like a kid at Halloween if you can stretch Halloween out for several months, and I love that feeling. Forty pounds is a lot for me, so it also helped. I had to make up my mind that I loved it because that was really the only way forward. Matthew, this is a film with very strong female characters, which is great to see, as a father to a daughter and as someone who has to go off and film movies, how did that affect your approach to the character? MATTHEW MCCONAUGHEY: Let me say this, I’m in a fortunate position because my family can come with me when I head off. It’s something I’ve thought about, because Cooper’s chasing a dream that was taken from him and he’s sitting there on a farm when that dream is reintroduced to him, and the question of what if I did have to go off? Because I will probably have to go off, for a month at a time leave the family. That’s a much more minor situation than what we have with Cooper in Interstellar. 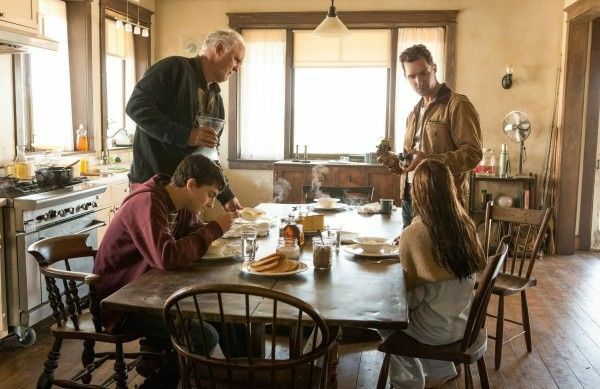 I mean, bring it back to family real quick, if you take a snapshot of this panel we’ve got some Nolan lineage up here, and they all are experts on they’re own part of what do on the film as writers and producers, and Chris has a daughter, so it was apparent to me early on that this was about parents and children. That’s obviously where the aorta of the film emotionally sits. Even if you’re not a parent, you have parents and you’ve been in those situations where there’s a certain kind of goodbye – nothing this extreme exists, but I think that’s what everyone holds onto, that common denominator that runs through this that everyone can understand. Matthew, has winning the Academy Award had any kind of affect on your career or your life? And since you’ve accomplished so much, do you have a bucket list of things that you want to do? MATTHEW MCCONAUGHEY: I’ve got some things that I want to do that I won’t share, they’re for me. Has it changed? I’ll say this, this is something that Chris and I talked about early on in our approach, we talked about being obsessed and that the job that you’re doing right now could be the last one, or at least approach it like it is the only one. That’s a great reminder and a great way to go into everything. So I would say probably with respect to what has happened to me over the last couple years, I have more obsession even over what I’m doing at this moment. It could be the last one. I hope it’s not, but it could be. Working off an earlier question for the cast, did any of you come into this film much like your own characters or the characters that surround you, thinking that space exploration was a nice thing to do, but not necessarily critical to humanity? And how did working on the themes that this presents change your perspective on space exploration? 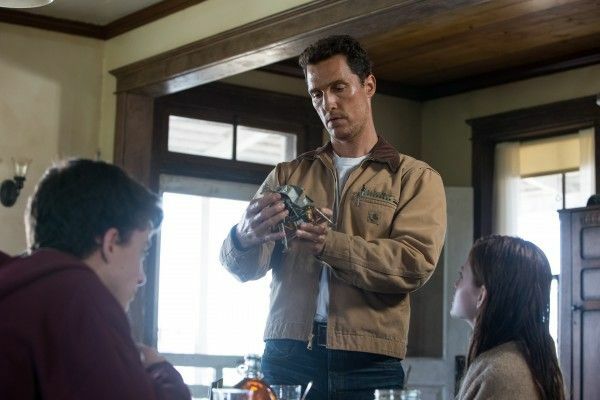 MATTHEW MCCONAUGHEY: It was something that I didn’t consider as much in the vernacular of thinking that as we evolve is the new frontier out there? And if it is, why? It just didn’t consider it or think about it that much. One of the things that I got from this film was that mankind’s expectations have to be greater than ourselves and that, as Chris said earlier, the further out there we go, the more we find out that it’s about you and me, right here. So it’s much more of a tangible idea, an attainable thought. I’m in no way an expert on it. I can have conversations about it now that I couldn’t have a year ago before getting on this film, but it’s now a much more four dimensional outlook as far as where we’re going and which way to look with that new frontier. JESSICA CHASTAIN: I remember when I was a kid my first real confrontation with space travel was when the Challenger exploded and I remember how traumatic that was for me, because I remember watching that on the news and all the children in our class were watching. I was very young. So I would never have imagined that it was something that I wanted to do. I think that we, as human beings, always need to conquer our fears and reach beyond our grasp and I think it’s very important that we don’t become complacent or stagnant. The wonderful thing about being an actress, not necessarily in this one, but I get to act those explorations beyond what I myself am physically capable of. ANNE HATHAWAY: Picking up from something Jess just said, one of my first experiences with the space program was with the memorial that was built for the Challenger. When I was in 7th grade my entire class spent the entire school year preparing to launch a spaceship all together. We all had our different jobs that we had to learn how to do, we learned the math that you needed, we learned the practical skills that you needed, and I thought that was really cool. So I think that if you can take a tragedy and find the gold in it and turn it into something positive, that’s great. And I’m hoping that the suspension of the space program is just that, a suspension, and that it’s not the final say in the matter, because I think we need it. I want to talk about inception, not the movie, but the inception of this project. What was the initial idea that started off what we now see on the screen? What was your initial reaction the material? JONATHAN NOLAN: The inception of the project for me began in 2006 or 2007, that was when I first started thinking about it – and I was struck in that moment by what felt, for a variety of reasons, felt like to be growing up in this age, to be growing up in this country, in this moment in time – there’s a line about this in the film – it feels like every day is Christmas. There’s some remarkable technology, there’s some remarkable thing. You get to a certain moment where you realize all those humans who landed on the moon did so in between Chris being born and me being born and no one had gone back since, all these Super-8 films we grew up watching of rocket launches, you get to a certain age and you realize all the speeches about going back, they’re speeches, there’s no money there, we’re not going back. And that moment, it felt like the melancholy or the sadness of that was to imagine as a species that we might have peaked, that if you charted our evolution as a species in terms of altitude, we peaked in 1973. That was kind of a sad realization. Growing up you’re promised jet packs and we got Instagram. Kind of a bum deal, I think. So I was rooted in the optimism of what is the next moment in which we start to journey again. CHRISTOPHER NOLAN: I was born in 1970 for the record [laughs], but for me the inception of it was talking to Jonah about the script he was working on. He was working on it for Stephen Spielberg at the time, but we always bounce ideas off each other, and it just sounded incredibly exiting. What it was that got me was the way Jonah originally explained it to me, that it’s really about an inevitability. We’re going to leave this planet at some point further than we have, we’re going to go beyond the moon, we’re going to go to mars. We all kind of know that on some level, I think actually. So there’s an inevitability to human evolution, this being the next step. The idea being that with this story you could view the earth as the nest and one day we leave the nest, or the earth is the egg and the egg hatches and we go. That seemed like a massive thing that hadn’t been addressed in movies, and that’s the kind of opportunity you’re looking for. EMMA THOMAS: So yeah, obviously we were familiar with the project from the time Jonah was writing it when we were not involved, but I think the thing that really excited me about the notion of the script was – well first of all, I thought it would be an enormous amount of fun to make a movie that heads out into space, which is something that we had never done before – but I loved the fact that this is a project that deals with the excitement and adventure of space travel but at the same time has a very intimate story and is very much relatable, certainly I find it as a parent and frankly, just as a human being. I love the big ideas, the big questions that it poses; things that on the face of it might seem to be somewhat depressing. The idea that this earth, which we love – or certainly I do, it’s an incredible place – on the face of it you would thing a story about having to leave the earth would be a depressing one, but its actually – the thing that Jonah’s draft had and Chris continued, there’s a real hope to it and there’s a real sense of what we have as humanity that it unlike any other species, which is the resourcefulness and sense of adventure and resilience, and I found that to be an incredibly exiting proposition. For Chris and Jonah, there’s a lot of mind-bending science in this. How important was it to you guys to actually get it right – or as close to right that you can get something as crazy as time dilation, black holes, and wormholes – and what kind of steps did you go through to try to get it as right as possible? CHRISTOPHER NOLAN: Jonah spent a long time working with Kip Thorne, who’s an executive producer on the project, who’s a great resource in terms of knowing everything there is to know about the real physics of what’s theorized and what’s known about those issues. I had the advantage of coming to the project late, being able to look at what these guys had done, and a lot of my contribution was stripping things down, because they put in all these incredible mind-blowing ideas but I felt that it was more than I could absorb as an audience member. So I spent a lot of time in my work on the script kind of choosing what I thought were the most emotive, the most tactile of these ideas, things I could really grab a hold of. Then I found working with Kip to be very liberating because it wasn’t so much restraint of “well, science says you can’t do this”, it was more an exploration of ideas with him of “OK, what’s plausible? We could go here, we could go there.” I found it very exciting to work with him on that. There was an underlying message of environmental pollution and it’s going to raise some discussion, what were you looking at as far as the message you were trying to bring out? CHRISTOPHER NOLAN: I don’t like to talk about messages so much with films simply because it’s a little more didactic. The reason I’m a filmmaker is to tell stories and so you hope that they will have resonance for people and for the kind of things you’re talking about, but what I always loved about Jonah’s original draft, and we always retained this, was the idea of blight, the idea of there being an agricultural crisis, which has happened historically if you look at the potato famine and so forth. We combined this with ideas taken very much from Ken Burns documentary on the Dust Bowl and spoke to Ken at great length and availed ourselves of his resources, because what struck me about the dust bowl is it was man-made environmental crisis, but one where the imagery – the effect of it was so outlandish we actually had to tone it down for what we put in the film. But the real point is they’re non-specific, that we’re saying that in our story man-kind is being gently nudged off the planet by the earth itself and the reason is non-specific, because we don’t want to be too didactic or too political about it. That’s not really the point. For me it goes back to something Emma said earlier, which was that my excitement about the project was addressing a possibly extremely negative idea, in terms of the planet having had enough of us and suggesting that we go somewhere else, but that being an opportunity, that being a great exciting adventure to be on was something I found very winning about it. I believe the consensus is that space travel would be good, but I want to know from each of you what your thoughts are about life in places beyond earth. CHRISTOPHER NOLAN: That’s a pretty general question. EMMA THOMAS: For me, I have no idea what’s out there, but I don’t know if you’ve looked on the NASA website, but they do this genius thing where they show a picture every day – I think it’s called “picture of the day” [laughs], something clever like that – but one of the pictures that they showed, which I found to be absolutely incredible, it was taken from somewhere near Saturn I think, and it was of the earth, and it was a tiny little blue dot. It was absolutely incredible to look at that and think “Oh my gosh, that’s us”, and it’s not even taken from that far away when you’re thinking realistically about the relative distances we’re talking about when we’re talking about our universe. It made me feel like, oh my gosh, I mean, when you look at the stars in the sky and they all look like that, there has to be something else out there. There has to be. How could there not be? That’s what I felt, anyway. JESSCIA CHASTAIN: I agree with Emma. Mr. Nolan, you’ve had so many successful and amazing movies, what do you look for in a next project? CHRISTOPHER NOLAN: For my part, I look for a great story. What I found in Jonah’s draft was a very relatable situation, a great opportunity to challenge myself as a filmmaker in terms of various technical issues, but also emotional issues. I’m a father myself and I related to the character as a father and I wanted to really push that in the telling of the story. I couldn’t tell you any more specifically than that what I look for. I look for something that just grabs me and holds me emotionally. Matthew, could you talk about that incredible scene when you break down in tears? It was one of the best things we’ve seen all year on film. MATTHEW MCCONAUGHEY: That’s one of the scenes for me, as the guy playing Cooper, that I read and I put a proverbial tack in it and go, “That better work. That’s really got to work.” So on the day I just remember we shot that right after I got back. It was on Monday morning, I had gone away and had this very public weekend doing something with Dallas Buyers Club, and I was wary about that being scheduled at that point, because I had been living a very private life with Cooper and a private family on the set, that was my focus each day. I came back that morning and it was all about relaxing, and my friend says, “Hey it’s called relaxation for a reason, quit trying to make it hard.” And that’s one of those one’s when I say relax, to then receive. One thing is I didn’t see, on purpose, I didn’t see any of the footage beforehand and I didn’t want to, we didn’t rehearse because we were going to shoot the first one up. So then it was just about relaxing and receiving, and not planning out. It can be easy for an actor to go “Well I really have to do a lot” and then just saying “I don’t need to do anything, I’m not bound to do anything”. 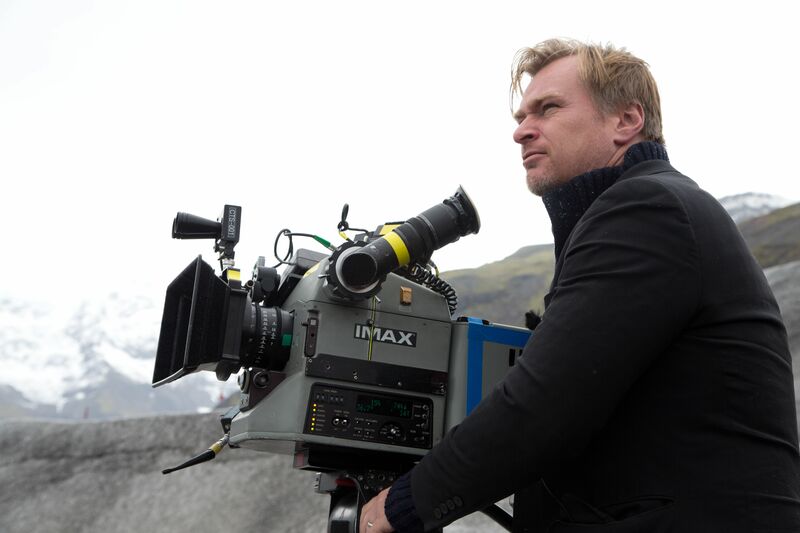 CHRISTOPHER NOLAN: It’s worth pointing out – I don’t know if Matthew would want me to reveal this or not, but I will – he felt very strongly that he wanted to come to it absolutely fresh and not know what he was going to see, because we had it all ready to go, and that the first take would be the one to use, and the technical demands that places on the crew are pretty significant. So we all had to be very ready, and we were, and we shot it, and we then went on to do subsequent takes, but what’s in the film is the first take, what’s in the film is the initial first reaction, and it’s one of those moments when you get to do a film where you get to drop the theatricality and the artifice, and you get to tap something very raw, very human, very personal, very very intimate and there were a lot of very manly man tears in doing these – it was an extraordinary thing to be involved with. I just really think – I mean, everybody knows what an incredible actor he is, but it was really electrifying to see. For Emma and Chris, how long was your first cut versus what people are finally seeing on the screen? Were there a lot of deleted scenes and any that came really close to making the final cut? CHRISTOPHER NOLAN: I don’t think there are any deleted scenes. I don’t really deal in deleted scenes. I think probably because I write the last draft myself before we go to the floor, so I try to weed out anything that I think isn’t absolutely necessary, so my process is usually to take the longer cut. I actually can’t remember what our very first cut, the first cut we screened for ourselves was, but usually it winds up being a half an hour shorter or something, twenty minutes shorter. Usually for me it’s just a process of compressing what’s there rather than pulling out whole elements. So I don’t think there are any deleted scenes. For Christopher, you’ve been working since The Dark Knight on bigger and bigger canvases with each film. Is that something you feel most comfortable in now? Can you imagine yourself going back to two people in a room or something like that? CHRISTOPHER NOLAN: Well, the fun thing about this one for me was a lot of it was one person in a room, not even two people in a room. A lot of it was extremely intimate. I mean the scene we were just talking about of Matthew’s and some of the stuff we were dong with Jessica and NASA was literally just one person talking to a camera, those kind of things. With this sort of film I get to do both. I get to do that and I get to do action and adventure. I get to do these sort of thrilling action set-pieces that you try to do on the scale of things, so I try not to be particularly self-conscious in my choices, but with this film I felt I had the freedom to try to put a lot of different elements together and try out a lot of different things that I’m interested in. In terms of scale what that resulted in was getting to do huge things and large outlandish things, and then getting to do very very intimate personal things. So for me that’s sort of the best of both worlds as a director. Did you guys research with NASA? CHRISTOPHER NOLAN: We did quite a lot of research before we designed the ships, before we figured out how we were going to film it. One of our greatest resources was IMAX and their relationship with NASA, because over the last thirty years – the same cameras we used to shoot the film, they’ve gone into space, they’ve been in low earth obit, they’ve shot all the international space station repairs and they have this incredible library of footage, these great films that filmmakers like Toni Meyers have put together. So one of the first things I did was get the designer, the DP, the visual effects supervisor, we rented the big IMAX screen in City Walk and we projected all these IMAX films in one day, we watched as many as we could to immerse ourselves in the detail of it, the feeling of it. Toni Meyers, we had a lot of good conversations with her and she put us in contact with Marcia Ivins, who’s been in space five times and was a helpful resource for myself and also for the actors. We tried to get the feeling of the details correct. We tried to get the appropriate textures of what this kind of space craft would need to be. That weird tension between the physical intimacy of a space ship, and the fragile nature of the industrial quality of it, and then the cosmic scale of where it’s going, we tried to always sort of play that. We were certainly very happy when Marcia came to visit the set and seemed quite impressed with the way we put it together, it felt quite credible to her and that was a bit of a sigh of relief. For the Nolans, during the script process what was the hardest nut to crack? What was the thing that you argued or violently disagreed about the most in getting to the final script? JONATHAN NOLAN: I’m going to let you answer that [laughs]. CHRISTOPHER NOLAN: Every collaboration I’ve had with Jonah on a script has been different because of our different circumstances and how we worked on it. This one is very unique in that he worked for a very long time on it without me being involved and then he got very busy doing other things, so I sort of said, “Look, can I take this and combine it with some other ideas I’ve been working on.” So it was a bit more along the lines of him going “OK take a shot, see what you do.” Then I showed him what I’d done and luckily he seemed reasonably happy with it. So it was a different kind of collaboration for us. I think I got to reap the benefit of many years of research and development on his end and I got to come in with a fresh pair of eyes and kind of make it my own, which is a fun thing to be able to do and hopefully he’s happy with the finished product. But I don’t want to her any arguments because he was off doing other things.